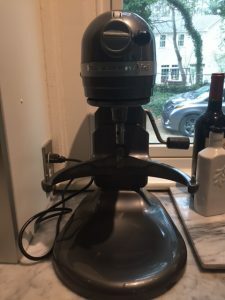 I love my food processor and use it all the time for making pesto, chopping a lot of garlic, salad dressings, doughs, dips, grating beets or cheese. The endless list of jobs that are made simple with the processor is amazing. 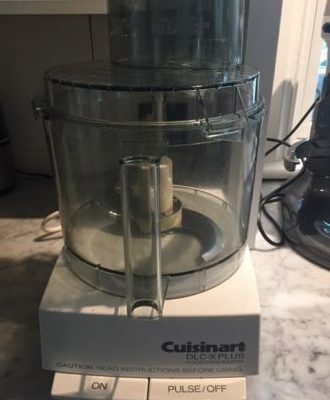 I have had the same machine (a Cuisinart) for years and rarely use any blade but the standard cutting one. I occasionally break out the grating blade which is fabulous for large amounts of cheese, beets or carrots. It’s easy to clean, simply load into the dishwasher or use hot soapy water and I leave it out on the counter so it’s convenient to use. The only other gadget you might need in the kitchen is an immersion blender which I love for pureeing soups or whisking a quick batch of whipped cream. Make sure when you buy one to get the attachments. It comes with a whisk, a puree and a mini chopper attachment. Easy to clean with hot soapy water and can be stowed away in a drawer for easy access. I have a kitchen aid only because I occasionally make a cake or make pasta dough with it, but it’s not necessary if you don’t bake often. You can use a hand held mixer for most desserts. The kitchen aid is large and heavy so if you don’t have the space or don’t want to take it in an out of the pantry I suggest sticking with the hand held.